Love lingers in the air as the West Coast sheds the chocolate overcoat of Valentine’s Day. Feb. 19, 2016 9:00 a.m.
Love can be many things, but fickle isn’t one of them. Enduring change is one of love’s truest tests. Sports teams trade our favourite players, boyfriends grow moustaches, girlfriends switch hairstyles, kids go through phases, pets endlessly test our patience and yet our love endures. Landscapes change too and while changes can be unwanted, and in some cases fought against, our love for this place endures. We love it here. Both Tofino and Ucluelet can see significant change on the horizon. Tofino has been forced to accept a new $10 million police detachment and Ucluelet is losing an iconic vessel-turned-resort that’s rested in its harbour for nearly 40 years. It seems strange that a $10 million building Tofino will not pay a penny for would be unwanted. To put that price tag in perspective, the Ucluelet Community Centre had a budget of roughly $9 million and the West Coast Multiplex Society is trying to raise $6 million to bring us a skating rink. Councillors Ray Thorogood and Al Anderson have both noted that if the new RCMP building were a library or community centre no one would be clamouring against its design. This might be true but that scenario is moot because designs for a library or community centre would be created with public participation. There was no such participation with the police building because, as the RCMP has pointed out, the opinions that mattered belonged to the bill-payers. Subjectivity can derail conversations about design but, regardless of taste, if you hang a van Gogh in between four Rembrandts, it doesn’t matter which painter you like more, the van Gogh will look out of place. The new two-storey detachment, with its zinc tiles and butterfly roof, will look out of place in Tofino. Perhaps though, this obvious change in landscape will lead to a change in crime and complaints. Tofino’s council receives an endless supply of letters bemoaning uncaring litterers, ruckus-causers and noisemakers each summer. If the most noticeable building in town is the cop shop, summer’s visitors might hesitate to run amok. Maybe one controversial change can begat another welcomed one. He noted though that it would kill the yard in front of the current detachment and encroach on the sidewalk. “It’s right on the main pedestrian drag and the thinking behind putting a building right on the sidewalk is that it is filled with little businesses that are inviting and add life to the sidewalk, in this case that’s not so,” he said. The walk down Campbell Street will be forever changed and the architectural departure has potential to become the status quo as incoming developers look to the town’s newest building to model future designs but, maybe it’s time to take down the Rembrandts and embrace the van Goghs. Times change, love remains. The landscape will never be the same, but your love for Tofino will endure. Ucluelet recently found out the Canadian Princess is leaving town. She’s been here since 1979 and many of us have never seen the inner boat basin without her. This change brings with it a tension much more severe than aesthetic angst because jobs will be lost and there is nothing quite so terrifying as the place a mind goes when a career disappears. As is the case with any unknown, it becomes far too easy to focus on worst case scenarios. Love, though, is on your side. Tourists love it here and, at press time, the Canadian dollar was hovering around 70 cents American. 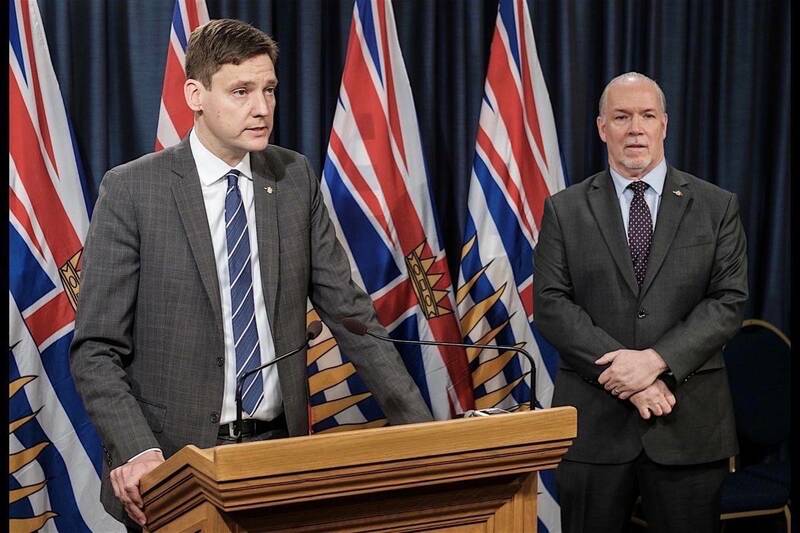 This means Albertans, mainlanders and Islanders will shy away from Oregon and California this summer and it also means Americans will be rushing in to double their dollars on our Coast. We will be packed, we were already packed over the Family Day weekend. The Princess will absolutely be missed but there is an excitement to see what replaces her at the harbour and opportunities abound. We will continue to love our surroundings and tourists will continue to travel from across the globe to share that love with us. Even our darkest and rainiest days are popular because of their beauty. Tofino’s downtown will change, Ucluelet’s harbour as well, but our love for this place will endure. Andrew Bailey is the editor of the Westerly News. You can find his weekly column ‘Behest of the West’ on page 4 of our print edition every Wednesday. Lovekin Rock between Tofino and Ucluelet is a hazardous spot.